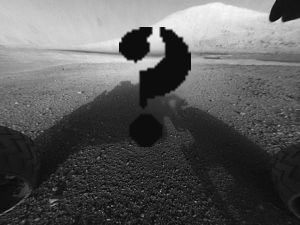 The first day of information streaming from Mars by the rover "Curiosity" has delivered an unexpected result in the form of undeniable proof of the existence of a Christian God, NASA said in a press release hours ago. We spoke over the phone with Curiosity team member Gregory Galgana Villar III about the startling news. "Curiosity appears to have stumbled upon the physical embodiment of God at around 11AM EST this morning. We have not released the video evidence, as there are concerns stemming from the Department of Homeland Security that when this now clearly undeniable proof of God's existence discredits all the worlds other religions there will be massive riots and uprisings from the members of those perspective denominations of faith." We asked Mr. Villar to describe what he witnessed in the video, and he gave a somewhat vague description that included a bearded male figure "wrapped in the light of omnicient compassion", who imparted proof of his identity and details of his message to all who viewed the video by some supernatural means. Villar was reluctant to go into detail about the message from the creator, but did say that God was very clear that He "certainly hates fags", and revealed the truth to be "somewhere between catholic and protestant doctrine, although the message has been corrupted over the years". "I don't know how to proceed from here. I mean, pretty much all of us here at NASA were sure He didn't exist, but now we are the first human beings in history to have documentation of a visual encounter with Him. Most of us are planning to use up our vacation time to do some serious spiritual introspection, and I can tell you that I will personally be taking the sabbath MUCH more seriously from here on. And I have a lot of forgiveness to seek in the upcoming days..."
Until now the atheist movement had been gaining global traction, particularly in europe, where as many as 60% of the population are now self-identified atheists. Assertions that religion serves too great a purpose of social cohesion to not have been invented for that purpose by those seeking to mold the poor, illiterate masses to do their bidding, or that any argument that offers proof in favor of a specific religious truth could have minor details altered to argue for a different, mutually-exclusive God, have now all been discredited. We have reached out to Dr. Richard Dawkins, biologist and notable atheist, for his statement regarding the situation, but he has not yet responded. And in the United States, an overwhealmingly christian nation, there are fears about what impact the news will have on this year's presidential election, given that candidate Mitt Romney's belief in the mormon doctrine took a serious blow this morning, and many still believe Barack Obama to be an antichrist-in-waiting. Hopefully answers to these questions and countless others will be revealed when further details are made available.